Family run local bakers based in the heart of Sussex and Surrey. 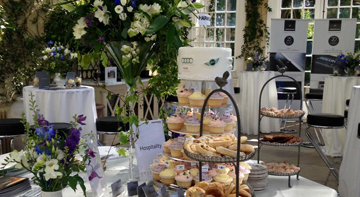 We offer a variety of services including handmade birthday and wedding cakes; event catering for any occasion and wholesale to local businesses in Sussex. We are proud to have established a reputation for providing a quality of product and service whilst moving with the times to provide for a changing market. As a result Truffles has become so much more than your friendly, local baker. Despite our growth from a one shop bakery to thirteen, Truffles has continued to maintain a presence in the local community. We provide ongoing fundraising support in local schools and charities. Of one thing you can be sure, we are passionate about our products, our customers and our staff and are committed to be recognised as simply the best bakers in the South of England. Truffles Bakery took over the Shoreham Airport restaurant in 2012. With an incredibly hard working and dedicated team we rebranded the whole restaurant and named it after the first flight ever taken by Harold Piffard on his self-built Hummingbird bi-plane.